The Illegal Trade in Ivory and Rhino Horn TRAFFIC report for 2014 recommends sophisticated technologies and law enforcement techniques in African sea and airports to fight against poaching and illegal traffic. “There have been years without any real action on the ground when it comes to controlling the illegal ivory market,” said Oeystein Stoerkersen, chairman of the CITES (The Convention on International Trade in Endangered Species of Wild Fauna and Flora) governing body during the CITES conference in Geneva in July 2014. His organization has set Thailand an August 2015 deadline to respect regulations or face severe sanctions. Despite all the heavy trade band pressure put on some Asian countries, the trade in Ivory and Rhino horn still remains very fluid. CITES announced in July 2014 serious trade sanctions on Thailand and Bangkok, if they don’t regulate their ivory sector, which supports a lot of poachers. TRAFFIC, a wildlife trade monitoring network, says that since January 2014 it has recorded 18,747 ivory seizure cases and 2,083 non-ivory elephant products. Most of the traffic is done via the sea or through airports. The container shipping business represents the greatest menace for the fight against this trade with less than 5% of ports applying the CITES law enforcement action for all containers entering and leaving the ports. In August 2013, The Guardian UK reported that China had seized a shipment of illegal ivory, rhino horns and leopard skins worth $5.3m (£3.4m) from Nigeria. According to the report, “authorities at Hong Kong's port confiscated 1,120 ivory tusks, 13 rhino horns and five leopard skins weighing a total of 2,266 kilograms (4,997 pounds)”. “Movements of ivory within Africa involved a great number of countries, and considerable trafficking between Sudan and Egypt, a major unregulated ivory market within Africa that is far removed from any elephant populations, was also evident. On Africa’s east coast, Tanzania, Kenya and Mozambique also emerge in this period as exporters of ivory from the African continent. 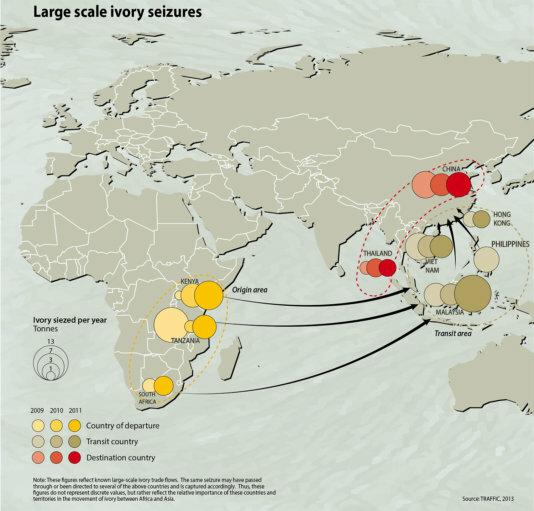 South Africa, however, is the most prominent country owing to one exceptional 7.1 ton movement of ivory from Malawi through the port of Durban to Singapore, and then reportedly for onward shipment to Japan,” says Tom Milliken, TRAFFIC scientist. He adds that China has replaced Japan as the world’s leader in the trade, the highest end market. WWF leaked documents this year that showed that current Thai law allows ivory from domesticated Thai elephants to be sold, making it simple to dry-clean poached African ivory. WWF analyst Colman O’Criodain, who was also a participant at the CITES Summit in Geneva, said “Thailand’s market is fuelling the illegal assault on African elephants”. Tracing the routes of this illegal trade, TRAFFIC points out, from 2000 through 2008 there have been significant export activity springing from the Atlantic Ocean seaports in Central and West Africa, particularly Douala (Cameroon), Lagos (Nigeria) and Accra (Ghana), and from Kinshasa (Democratic Republic of the Congo) to Belgium by air. These sea and airports are used because they lack expensive technical equipment, such as cargo scanner machines, that can scan containers, dogs’ sniffers system and sophisticated x-rays. The latest traffic report for 2014, released last month, says that 72% of Central Africa’s elephant population has been wiped over the last 12 years. And the Tanzanian Selous Game Reserve has lost 57,000 animals from the 70,000 that were left in 2007, 68.6% in just seven years. This represents an enormous loss for Africa, whose rhino population and elephant population continue to shrink. 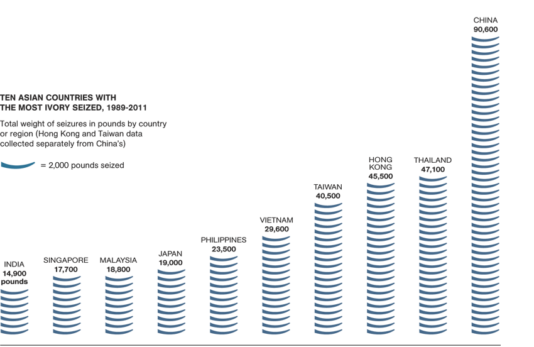 The report also identifies the trade estimated at USD 5 - 20 billion per year. TRAFFIC also demands more judicial actions to be taken on those who are apprehended for participating in this trade. It decries only 9 of the 78 cases registered since 2009 by the TRAFFIC's Elephant Trade Information System (ETIS) have been out to trial. There is good news for African governments who need to deploy massive financial and human efforts to fight this illegal trade. Since June 2014, UNEP has identified high-tech equipment, cheap and sustainable methods that can counter poaching efforts without requiring armies of rangers or risking lives. They include: acoustic traps, mobile technology, mikrokopters, radio frequency identification tags, encrypted data digital networks, camera traps, DNA testing, radio collars, metal scanners, and satellite imagery. You can see more of their elaborate counter-poaching methods here. A Kenya Wildlife Service Ranger inspects and numbers a confiscated ivory consignment at the Mombasa Port in October 2013. These are the contours of the global ivory trade that, according to one study, killed an estimated 7.4 % of Africa's elephants in a single year. A ranger of the Zakouma National Park measures dozens of elephant tusks.